I've found myself at the head of yet another D&D group. We're a smaller bunch of players, hovering around 4 players at the moment though teetering at the edge of 5. The group largely consists of Wesley's co-workers and their significant others. We've had three sessions so far and each one has had its share of unexpected moments. I've missed playing tabletop regularly. The last time I had an opportunity to play was just briefly with Mike, Morgan and Wesley at PAX. Even then, I found myself running the game rather than playing. It has been quite a while since I was just another member of the party. I don't often miss it, but there are times I wish i could hand off my role as DM to someone else for a while. It's a natural feeling to have as a DM. I know that eventually I will have the opportunity to step back into a player role. For now, I am more than happy to run adventures for our new group, especially given some of the new material that Wizards has published. Volo's Guide to Monsters is a really spectacular text with a lot to offer both players and DM's. It has in depth information on a number of iconic monsters, a great tool for anyone building a campaign. The bestiary within it also brings back some old school monsters that can really mess with an unprepared party. For players, there are 7 new starting races, including the return of the Goliath and Kenku from 4th edition and a new version of the Catfolk called Tabaxi. In addition to these seven races, there are player stats for a few notable monstrous characters like goblins, orcs, gnolls and kobolds. I'm particularly curious to see what a Tabaxi monk could do, given their new natural weapon and bonus to dexterity. 5th edition has been a powerhouse for tabletop players looking for character depth over detailed rules. I've been a vocal proponent of this direction since the launch of 5th edition in 2014. The previous core books have done a great job of giving players and DMs tools and systems that lend themselves to more fleshed out characters (both PC and NPC). Volo's Guide has taken that immersive spirit one step further. 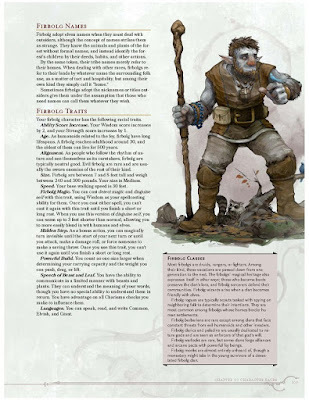 The first section of the Guide is a trove of monster lore written by Volo, a verbose and fairly self-sure adventurer. His advice comes off as cocky and descriptions of some monsters are dangerously close to just being an outright brag. To counteract this, there are notes scattered throughout the book from Elminster Aumar, Archmage of Shadowdale. These notes are often jabs at Volo's own writing, or an aside about a particular monster of passage. There bestiaries are typically dry save for the art, Volo's Guide takes on a life of its own and is a joy to just read through. Our new group met with its first player character death the other week. I'm looking at new character possibilities for him and he is considering a Firbolg barbarian. I'm glad that he's found something he like and can identify with, but there is a serious part of me that wants someone in the party to play a kenku, if only to play with the mimicry trait and see what it does to party communication. The Kenku in Volo's guide can read and write common, but they can't speak it directly. Instead, they "speak" through making sounds that almost perfectly mimic noises they've heard, even voices. I really hope that Wizards continues on this path for a while. In the 20+ years I have been playing D&D, I have never been so happy to see the designers branching out into new territory. The character-centric design flow of 5th edition is marvelous and stands to keep people playing it for many years to come. This direction has opened up the possibilities for players that, up to now, had only been able to focus on the numeric minutiae of the game's rules, which can feel rather stifling to a player who just wants to role play his character a bit.